Is quality on your mind? If so, have your questions answered at #SQA2019. 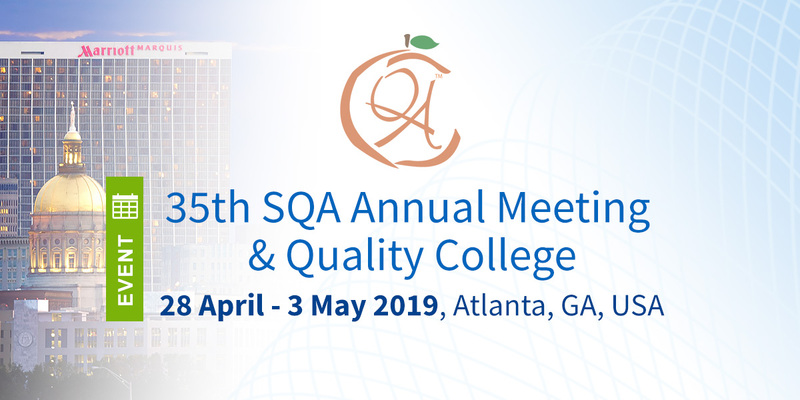 ADAMAS will be attending this year’s Society of Quality Assurance (SQA) 2019 35th Annual Meeting themed ‘Quality on my mind’ in Atlanta, Georgia, USA, 28 April – 3 May 2019. If quality is indeed on your mind, you will be in the right place at the SQA 2019, as ADAMAS will be at Booth #117 to answer all your QA questions. Steve Bliss, Vice President, Business Development, Donna Nunemaker, Senior Consultant and Gloria Miller, Consultant will be at our exhibit to meet with you. Bring your most challenging compliance and QA questions to our professional experts and enter our free raffle for a chance to win one of two JBL Wireless Speakers. We provide unparalleled quality, in audit conduct and report deliverables, consistently, anywhere in the world; whether it is GCP, GVP, CSC, GLP or GMP, ADAMAS have a solution that fits, delivered by our dedicated, highly experienced, highly trained and motivated team. So, we can be trusted to help you overcome your most pressing issues. If you’re attending SQA 2019, we look forward to meeting you. If you can’t make the event but would like to learn more about ADAMAS, please call us on +1-919-341-3361 in the US, +44 (0)1344 751 210 in Europe; or visit our website at www.adamasconsulting.com.